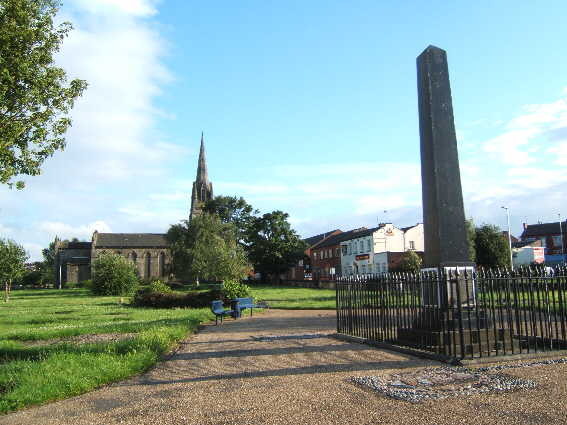 Just outside Leeds city centre lies the area of Holbeck. Named after the stream that runs through it, Holbeck was once a very industrialised area. The area was once an important centre for the flax spinning industry. It was here that John Marshall with the help of engineer Matthew Murray mechanised the industry in much the same way as Richard Archwright had earlier done to the cotton spinning industry along the Derwent Valley of Derbyshire. The area also became an important centre for the manufacture of machinery. This began with the mill machinery such as had been used in flax spinning. Stationary steam engines were built, and later the first successful railway locomotives. One company specialised in producing something as simple as needles for the textile industry, yet with so many mills producing textiles this was a big business. It is no exhageration to say that the Holbeck area played an important part in the industrial revolution and the innovation that was happening amongst the firms here can still be appreciated by looking at the buildings that survive. 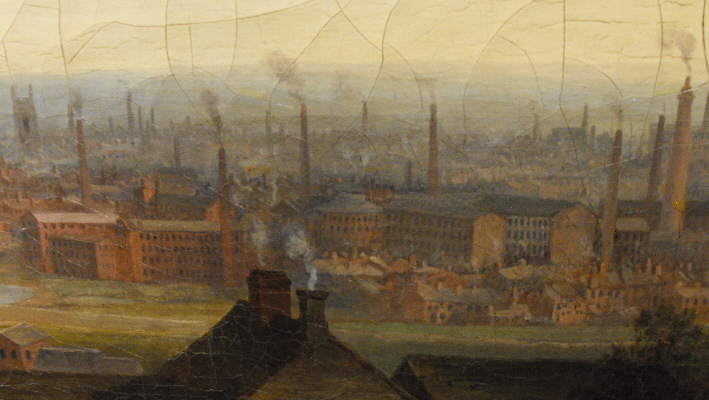 Seen in a painting of 1844 (this is part of a large veiw of Leeds displayed in the Abbey House Museum at Leeds) the Holbeck area looks nothing special, a typical 'dark satanic mills' sort of scene, close up however there were some very interesting buildings. By the wonders of modern technology you can now take a guided tour of the historic sites of Holbeck without having a tour guide at your disposal, it is one of the features offered by the development company Holbeck Urban Village on their website. The commentry can be downloaded on to an MP3 player. Holbeck is reached by passing under Leeds station through the "Dark Arches". The dark arches are themselves quite an outstanding piece of engineering. As the railways were built in to Leeds it was soon found that a railway line across the city centre from east to west was needed to allow journeys across Leeds to be made without either taking a long journey around the city or having to change stations in Leeds. An original scheme was rejected as it would have lead to the demolition of much of the city centre. The later scheme had the New Station situated on a large viaduct spanning the River Aire. A massive engineering project, a series of arches were built with passageways connecting them, many of these vaults were used for handling goods from the railway or nearby canal. This Grade 2 listed bridge was built by George Leather Jnr, engineer of the Aire and Calder Navigation between 1837 and 1839. Beneath the bridge the Hol-beck diverges from the River Aire as does the Leeds Liverpool Canal. Above – Office Lock and the Tower Works in the background before the beginning of redevelopment in the area. The 127 mile long canal was proposed in 1767, received an act of parliament in 1770. Construction began at various locations and gradually the canal opened a section at a time, it wasn't until 1816 that the canal fully opened. 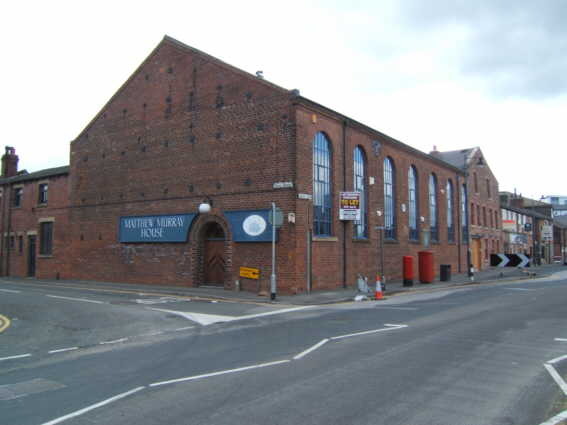 The earliest building in this area is the canal warehouse built to a design by canal engineer Robert Owen in 1776, in time for the canal opening as far as Gargrave. Unlike later buildings in the area this building is constructed of stone (picture) . Next to the building is a crane of 1845. In the area between the canal and the railway viaduct are a couple of small docks, now used as a focal points of a modern redevelopment of the area. These docks were used for repairing boats between what could be quite long journeys along the canal. 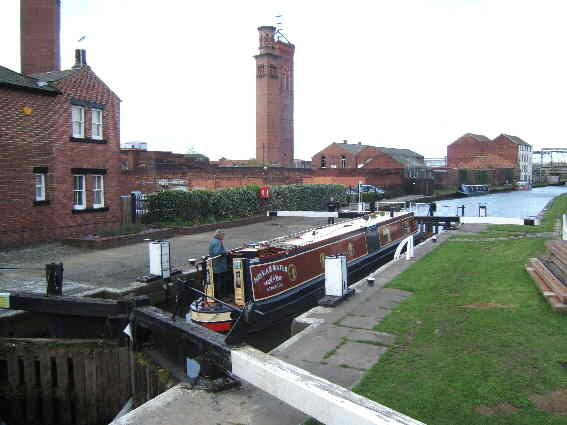 Only a mile along the Leeds and Liverpool canal is the Leeds Industrial Museum at Armley Mills. Housed in mill buildings sandwiched between the canal and the river the museum has displays and exhibits about all manner of industrial history in the area and is well worth a visit. The oldest of the three towers is from 1864 and is based on the Torre del Commune, or Lamberti tower in Verona. Next to it is the Giotto Tower based on the Campanile of Florence Cathedral (picture). The Giotto tower is about half the height of that in Florence and rather than the marble cladding it has a finish of red brick work and local Burmantoft tiles. Inside this tower, which was in fact a chimney, was fitted with filters to remove harmful metal filings from the emissions. The third tower looks plain by comparison but is believed to be based on one of the towers of St Gimignano in Tuscany. The complex known as the Round Foundry begins on the corner of David Street and Water Lane, the site was once the works of Fenton, Murray and Wood and home to the famous engineer Matthew Murray. Murray had begun his work in Leeds as an engineer with flax miller John Marshall (we'll come to part of his mill complex shortly) and made a number of revolutionary improvements to the machinery used in the industry. This led to him establishing his first mill machinery factory with David Wood in rented buildings nearby at Mill Green, later moving to the purpose built works once joined by financial backer James Fenton. The site was famous for its Rotunda, a round brick building, actually a 'fitting up shop' but the name Round Foundry caught on and the site is still called that today, even though the Rotunda has gone. The works is most famous for its locomotives built for the Middleton Railway. Prior to these locomotives none had been succesfully applied to freight traffic, they broke the rails with their weight and were not particually powerful. By using Blenkinsop's patented rack railway system the locos Fenton, Murray and Wood built were light enough to run on the rails yet powerful enough to haul impressive loads. On seeing a Murray / Blenkinsop locomotive George Stephenson was adamant that he would build a better locomotive. The works built lots of other machines. By the time the Middleton locomotives were built they had already been building mill machinery for over a decade and were producing some particually good stationary engines. 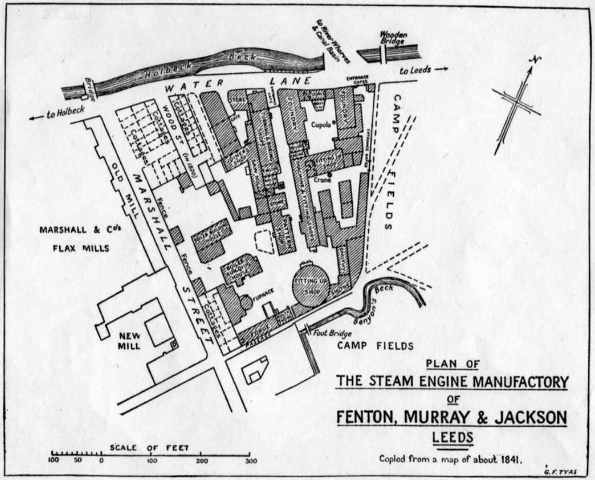 This led to a bitter rivalry with Birmingham firm Boulton & Watt, to such an extent that James Watt Jnr purchaced land next to the works so that they could prevent expansion and spy on their Leeds rivals at the same time. 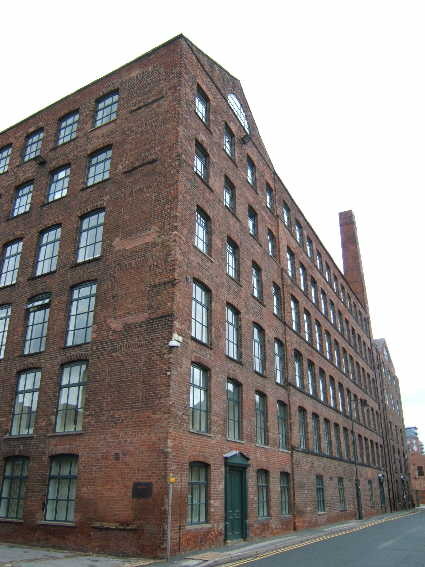 The building on the corner of David Street and Water Lane occupies the site of this, it was not part of the original Fenton, Murray & Wood works and was built later when the site was owned by machine makers Smith, Beacock & Tannett. After Murray's death in 1826 the firm became known as Fenton, Murray & Jackson with Murray's son-in-law having become a partner. There was a return to locomotive manufacture, the highlight of which was twenty of the Firefly class for the Great Western Railway. These included the first engine to haul Queen Victoria and the engine chosen to represent the GWR's broad gauge at the gauge trials. A number of staff went on to form the engine building industry of Hunslet, the subject of another of my guided walks. With much competition around the orders dried up and the company closed down. 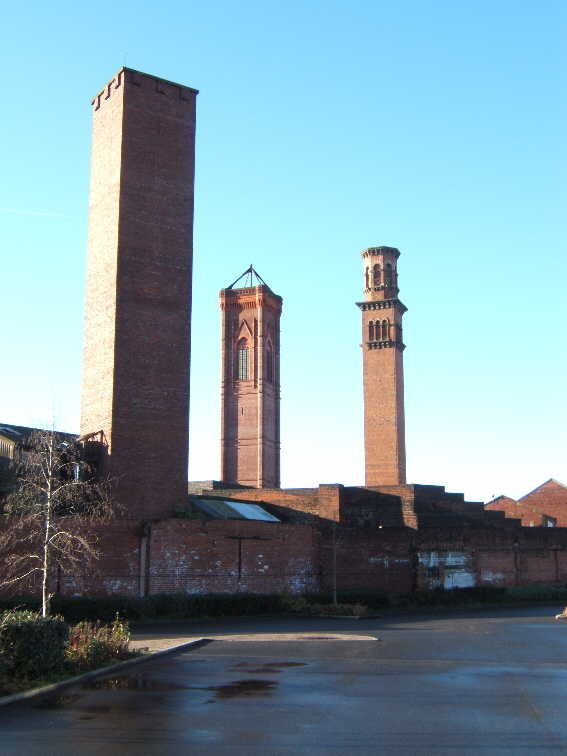 The site was later taken over by Smith Beacock & Tannett, the works was renamed Victoria Works and returned to making all manner of mill machinery. Sadly part of the works was badly damaged by a boiler explosion and in 1875 a fire burned down the famous Rotunda. Many of the early works buildings do survive as can be seen by comparing the site today with old plans of the works. Picture of Murray’s works from the rear. Unearthed foundations of a demolished part of the works seen in January 2007. At the back of the works site the perimeter wall of the Rotunda from which the Round Foundry got its name was excavated some years ago and the perimeter is now marked out in the paving. Foundry Street has been refurbished recently, much of the buildings here are original, though rebuilt several times over the years. Off Foundry Street parts of the complex such as the Saw Mill have also been refurbished. With its prime location close to the city centre the area is being put to use as offices, bars and restaurants. The redevelopment work has been sensitive to the historic value of the site with old buildings refurbished and several plaques fitted giving visitors details of the history of the site. The layout of the site is very different to that of later engine building works. This site brought together a number of seperate trades for the first time, though each trade had its own part of the complex so for example we see the courtyard around which woodworking took place and the small buildings in which the foundry work took place instead of the vast factory floors we'd see in later works. Picture of the Saw Mill Yard. Alongside the Round Foundry complex on Water Lane stands a number of surviving examples of the group of mill buildings that once belonged to John Marshall. The works of Murray, Fenton and Wood had been built alongside the flax mills of John Marshall due to the close relationship of the two firms. John Marshall was the son of a draper from Briggate and set up his first water powered flax-spinning mill in Adel. Having seen improvements in the mechanisation of the cotton spinning industry he was keen to see similar improvements applied to flax spinning. He moved from Adel to Holbeck in 1790, the first mill used a waterwheel to power the machinery. The water supply to the wheel was pumped in using a Thomas Savery design steam engine, its basic design being nearly a century old. Just three years later this system was replaced by a Boulton & Watt steam engine of 28hp capable of working 900 spindles. Matthew Murray soon set to work improving on this engine and from 1790 onwards he took out a number of patents for machinery brought in to use at Marshall's Mill. Along the bottom of the brick building are a row of inverted arches, these are not for decoration but to even the load of the five story brick building on its foundations. Beyond the size of the building, it is a fairly plain structure, though typical of the mill buildings that were built across the north of England. Beyond the brick mill buildings is Temple Mill, one of the most interesting mill buildings around and Grade 1 listed. The mill is quite an unusual design too, the large flat roofed complex had a large open layout, once the largest single room in the world. Plenty of light was provided by the 65 conical glass domes on the roof, the roof was covered by plaster, tar, earth and grass. This may sound similar to some modern concepts for eco houses, the reason for this turfed roof being that it provides effective heat insulation. It is believed that sheep were allowed to graze on the roof of the building and it has often been said that a sheep once fell off the roof, though accounts from the time of this have not been found. Inside the roof is supported by cast iron columns, featuring the papyrus design to match those of the office façade. Temperature and humidity were controlled using a forced air heating system and a series of channels under the floor from which water was evaporated, the humid conditions were essential while handling flax. Sadly one of the columns of the front of the building and a section of roof recently collapsed. Though with the importance of this fascinating Grade 1 listed building not forgotten work on its repair soon began. When completed the building should become an excellent art venue. The large open plan and well lit environment should mean the building is as well suited to this purpose as it was to its original use as a flax mill. Continuing away from Leeds on Water Lane we soon come to another old mill building. Tucked away in a corner of the railway viaduct and accessed through a bridge under the railway this mill buildings dates from 1793, making it the oldest surviving mill in the area. Originally a flax mill it soon became used by a manufacturer of mill machinery supplying many of the new mechanised mills of the area. It survived in this role until the 1981s and has since seen a number of other industrial related uses. A dominant feature of much of Holbeck is the massive railway viaduct that seems to weave its way through the old buildings. Completed in 1882 this was another part of the expansion in Leeds railways that saw the construction of the 'New' station and Dark Arches. The viaduct in 1500 yards long and has 85 arches as well as 6 metal bridges. An interesting feature is the old public footpath that runs from Bridge Lane to Marshall Lane, at one point this path is crossed by the Midland Railway line to Sheffield and the viaduct at the same point, what must have been an interesting problem for the engineers. 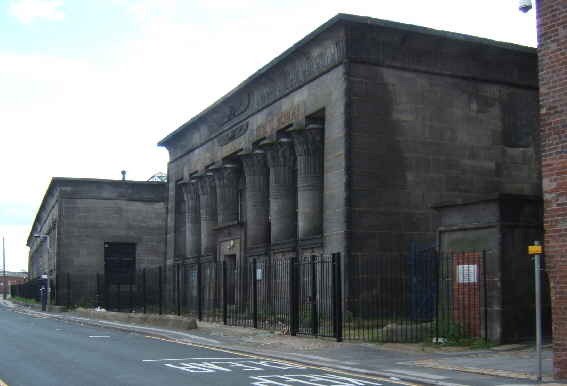 On the corner of Bridge Street and Nineveh Road stands the former engine repairing shed of Holbeck engine sheds, once the home of many of the mainline express engines that worked out of Leeds. Much of the site today is still used by local trains and track machines. Though the old roundhouses, coaling plant and staff accommodation building are long gone. The repairing shed and the ornate office buildings on Bridge Street remain. There was a village here going back to medieval times, however during the industrial revolution Holbeck became a densely populated area. Hundreds of back to back houses were constructed in the late 1800s, many of them still surviving, though seemingly under constant threat of redevelopment. Schemes in the past have seen back to back houses replaced with more modern council housing and with a number of tower blocks. On the corner of Marshall Street and Sweet Street West, it was in this pub that the train drivers' ASLEF trade union was founded. A blue plaque has been fitted to the building to note the pub's historical significance. Going up Stocks Hill and St Matthew’s street a cast iron obelisk can be seen, this is the monument of the Murray family tomb. The cast iron obelisk was produced by workers from his works as a tribute to their manager. Now Holbeck Mills Carpet Warehouse this brick building features a grand Renaissance style façade. Despite its change of use the interior of the former chapel is well preserved. History section of the Holbeck Urban Village Site.